No exact total of the dead from the Great War will ever be recorded, but it is unofficially set at between ten and thirteen million for all those nations involved. The Commonwealth War Graves Commission list the total number of deaths for the Empire forces as 1,114,786. In the most costly engagements of the war, during the 1918 German offensive at Picardy and Lys, British forces were sustaining casualties at the rate of 5,846 an hour. In comparison, the ‘natural wastage’ of troops that occurred on both sides of the Western Front on an ‘average day’ where no major assaults were timetabled was 2,533 killed, 9,121 wounded and 1,164 missing. Given these appalling statistics, what possible relationship could there be between sport and the monumental slaughter taking place daily during the First World War? A cursory examination of British life and leisure in the years preceding the war quickly provides something of an answer to this question…. Sports and games had increased in popularity beyond measure between 1890 and 1914, building upon the foundations of modern sport which had been laid in the late nineteenth century. For many, sport had become Britain’s universal panacea – the means by which one could cultivate not only a healthy body, but a healthy mind as well. More than this, sports and games were widely believed to develop in the young player a variety of character traits that were deemed beneficial for taking his place in society – loyalty, obedience, courage, moral strength, the capacity for leadership and a sense of fair play. The systematised use of games to achieve this character transformation in the young boy and adolescent emerged in the British public schools in the mid-nineteenth century, and, despite opposition, flourished under the epithets of athleticism, Muscular Christianity or the Games Cult. The applicability of such character traits to military life was not overlooked, and by the outbreak of war in 1914, sport was held by many to be the one common element in the British national character that would ensure victory over the enemies of the Empire. Sport would train recruits, rear successful officers, rejuvenate weary soldiers and ultimately help kill Germans. 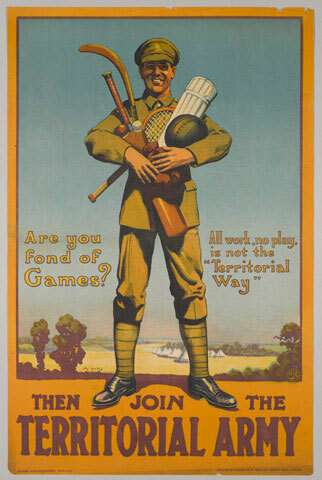 In distinct contrast to our own age, where sport is often characterised as surrogate warfare and written about in the language of battle, the 1914-18 war would be perceived to have considerable connections with sport, and the language of sport – particularly team games – would be a commonly-used metaphor for the passage and progress of war.